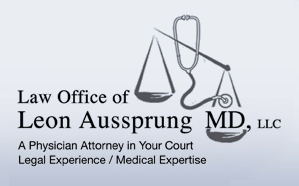 The professionals at the Law Offices of Leon Aussprung, MD, LLC are experienced in protecting the rights of the elderly in our nursing homes, personal care homes and assisted living facilities. A Nursing Home is required by law to provide for the safety, protection and health of your loved one. Unfortunately, many nursing home residents suffer neglect and abuse. Many nursing homes are under-staffed and the residents do not get the care they require to remain healthy. Staff is often under-trained and unqualified. The nursing home often fails to provide sufficient supplies to the staff. Nursing Homes are often dirty, smell bad and are unpleasant. Your family's complaints to nurses or administrative staff may have been ignored resulting in frustration and injury to your loved one. The elderly and their families have rights that are often ignored and violated by the nursing home. Many nursing homes place the profits of the nursing home over the care to the residents. As a loved one, you have the right to protect the dignity and self-respect of an elderly nursing home resident. At the Law Offices of Leon Aussprung, MD, LLC we have handled hundreds of nursing home lawsuits against many of the nursing homes in the Commonwealth of Pennsylvania. If you feel a loved one has suffered neglect or abuse in a nursing home, personal care home or assisted living facility, please feel free to contact our firm. We would be glad to discuss your case.